Fall Fearless and Fly with Joanne Sharpe! Welcome Joanne Sharpe! Thank you for sharing your journal page with us! Gorgeous lettering! It is so important to grasp hold of the idea that perfection is not the be all and end all. So many beautiful things are beautiful BECAUSE of their imperfections, their asymmetry. Bellissime le tue pagine gialle!! Exquisite composition, thank you very much for your kind words. Just beautiful classic Joanne style! 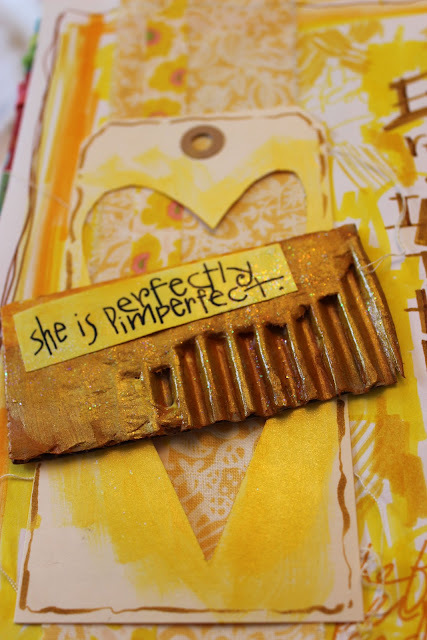 I love the different yellow tones and especially your piece of loved cardboard!Just PERFECT! I hope I'll be more present during this year. You're doing a great job!! The cardboard and your wonderful lettering make it go! Thank you for sharing and a Happy New year to you and your family. 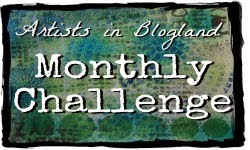 I love Joanne's art journal page and challenge. Happy New Year! 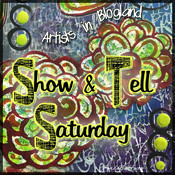 I love this - the monochromatic scheme; the variety in your lettering; the texture over the cutout heart; everything! Hello Carolyn your yellow page is full of optimism and so happy and bright! Wow, this one got me thinking! 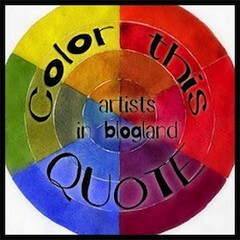 Joanne's artwork is brilliant - love the zing of yellow and yes, I think we are all perfectly imperfect. Perfection is rather dull, after all! Beautiful explosion of colour - happy colour!